Rob Duhig Dental proudly brings world class dental technology to patients in Sandgate. Our extensive dental lab and treatment rooms are equipped with the latest technology ensuring we can deliver cutting edge dentistry right here in Sandgate. Get the confidence to smile in no time at all. Robert Duhig Dentist provides cutting edge teeth whitening dentistry practices, here in Sandgate. 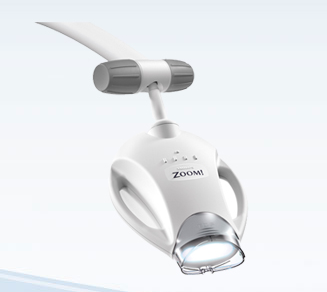 Zoom in chair whitening is a revolutionary, safer way to brighten your smile in no time. Learn more about it here. Robert Duhig Dentist Sandgate is one of Brisbane’s few providers of cutting edge breath analysis using the Oral Chroma machine. This state of the art machine measures chemical trace in your mouth to detect and target-treat bad breath problems. Learn more about our healthy breath analysis machine. 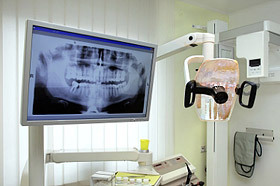 xrayConventional dental x-rays contain only low levels of radiation. At Robert Duhig Dental, we’ve reduced this exposure by a further 75% by introducing digital radiographic imaging. Digital radiographic imaging is the most advanced and accurate dental diagnosis method. This technology gives a clearer image that’s projected instantly on a monitor. It’s also used to evaluate treatment progress. The Intra-Oral Camera looks just like a pen and can manoeuvre around the mouth easily. This contemporary dental device transfers images of your mouth onto a monitor, so that you can see exactly what your dentist sees. The image can be magnified up to 28 times. We use this device to show you exactly what’s going on in your mouth so you can better understand why particular dental treatments might be needed.